Autochthony is a terrific word I learned as an undergrad and have to few opportunities to use. It means "the state of being autochthonous," which is a fancy word for indigenous. It is, rather obviously, made up of the prefix "auto" or self, stuck onto the word chthonic, a Greek word meaning "of or relating to the gods and spirits of the underground." I wrote yesterday about reading The Sacred and the Profane by Mircea Eliade, and how I didn't like it all that much, except for his discussion of sacred places. Eliade uses the term autochthony to refer to a religious feeling of "belonging to a place, and it is a cosmically structured feeling that goes far beyond family or ancestral solidarity" (140). I like this because it describes how I feel about the Sonoran desert, an area running through south central Arizona and extending slightly into Sonora, Mexico. It is a particular ecosystem with some of the coolest vegetation in the world--the saguaro cactus, for instance, a plant so iconic and interesting that it has come to symbolize the entire southwest, though it is indigenous only to the Sonoran desert. Thatcher, the town I grew up in, is not in the Sonoran desert. But Tucson, where my mom was born, where my grandparents lived til they died and where I went to college, is. I was in Tucson last week, and while it's not accurate to say that I ever forget that I love it and think it's beautiful, still, going home and encountering it again always has the force of a revelation. Tucson itself is a perfectly lovely southwestern city with its own mix of crappy and cool: it has way too much urban sprawl for both my taste and its own good. It has my beloved alma mater. 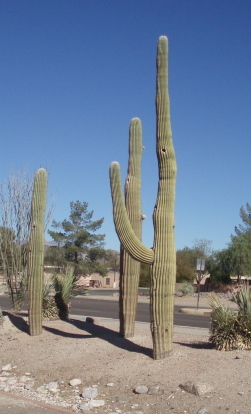 It has less ground water than many other cities in Arizona, and little access to water from things like the Central Arizona Project, so it has always behaved more like a desert city than Phoenix: Tucson has always had people who put down gravel instead of grass in their front yards and planted indigenous trees like palo verdes and mesquite instead of midwestern transplants like mulberries and elms and pine trees. It has one of the premier astronomy departments in the world and a commitment to dark skies, so it enacted measures against light pollution a long time ago; one thing that drives my father nuts is how few street lights it has, but I LIKE that. It's old--one of the oldest cities not only in the southwest but in the US: there has been a native American settlement in what is now Tucson since 200 ad, and a European presence since the 17th century. As a western city, Tucson is about the same age as Philadelphia. But the best thing about Tucson is where it is. The valley where it lies is, to me, one of the most manifestly holy places on the face of the earth, a place where I sense the earth as itself, as something with a sort of intelligence, a set of logical, efficacious systems that let it be what it is. I am not talking here about intelligent design or creationism; I'm talking about my awareness of the planet's ultimate indifference to me, the fact that it can get along quite well without me and the rest of humanity, that it does what it does for its own sake and not for ours, and that what it does works--for it, if not for us. There are so many things that contribute to this awareness I feel here. First of all, there are the mountains, the Rincons to the east, the Tucson mountains to the west, another small range to the south I forget the name of, and most of all, the Catalinas, the range to the north. They are crooked and craggy, with odd bumps and knobs sticking up all over them. They are so strange and stark that they look fake, a cardboard cut-out stuck in front of an overlit backdrop, but they are supremely real. They are at an angle that allows for a fascinating play of light and shadow throughout the day; ever since I was a little girl I've liked to watch the mountain change as the sun traverses the sky. Then there is the light itself, so intense, so thorough. I have been telling myself lately that the light in northern Utah is the same, but it's not: it's similar quality, but not intensity, and lacks the purifying, transforming quality of the light here. There's the clarity of the sky, both during the day and at night, which means amazing visibility for stargazing, and few things help us sense the sacred and our own small place in the cosmos like a sky abundant with stars. There are the sunsets, some of the most dramatic and lovely in the world: there's no better date in Tucson than watching the sunset with someone you really like. There is also the vegetation, not just saguaros but ocotillo and mesquite and varieties of cactus and all these cool things that I just LOVE. Now, I realize that in saying that this part of the world is to me manifestly holy and sacred, I'm saying as much about myself as I am about this place and the rest of the world. I understand and recognize its geological and botanical language, which is another way of saying that I belong to it, as Eliade would say, with a cosmincally structured feeling that goes beyond family or ancestral solidarity. The thing is, this language I understand, I can't speak it myself: words always fail me when I try to talk about what this all means to me, a failure that I value, oddly enough: I like the diffuse, inarticulate yearning and confusion I feel when I look at the Catalinas; it helps me know there is something more, something deep in the world-it is, in fact, the calling card of the sacred. I recognize that not everyone feels this, either about Tucson or about any place, and that some people feel it not about Tucson but about some other part of the world. I don't expect everyone I value in my life to share my sense of the sacredness of the Sonoran desert. But they must at least respect and value my love for this place: they can't roll their eyes or say, "But it's all brown! How can you find this beautiful? It's SO ugly!" like some people have; that's a deal breaker. And frankly I'm glad that not everyone understands this place's vocabulary, or more people would move here than already have. There are already more people here than the place can comfortably sustain, and someone needs to stay in Minneapolis. So don't misunderstand: I'm not encouraging you to move to Tucson. But if you get a chance to visit, go, and don't forgot to watch the light change across the mountains. What a nice thing to read (especially the next to last paragraph) this Sunday morning as I also look out my window at a blue winter sky and my river, flush with recent rains, rushing along to the Atlantic. One of my favorites, Chet Raymo, says when God is removed everything is holy. I read that to mean that this world, this universe, is sacred without the need of a middle man. Happy new year and belated birthday wishes. I'm so glad you like the entry, and so glad you have your own holy spot. Thanks for the statement from Chet Raymo; I think he and you are right. This page contains a single entry by Holly published on December 29, 2009 1:15 PM. Divine, Transhuman Models was the previous entry in this blog. Of Friends and Furniture is the next entry in this blog.